A while ago, Nester Smith posted one of my posts on her Nesting Files site. I respect her viewpoints. Her words have helped me RELAX more in my own home and had an impact on the rest of my family. I have a mad crush on her decorating philosphy, which has helped my living room become a great room for my family to USE. So honey, the swivel chair that can turn to view the fish tank and then the football game? Thank Nester Smith...because she made me think about the PEOPLE living in the house. Do you know how it feels when someone you respect gives you a thumbs up? It feels awesome. It made my day, week and month. I was even geeky enough to take a screen shot of a tweet where she called me a "smart lady". 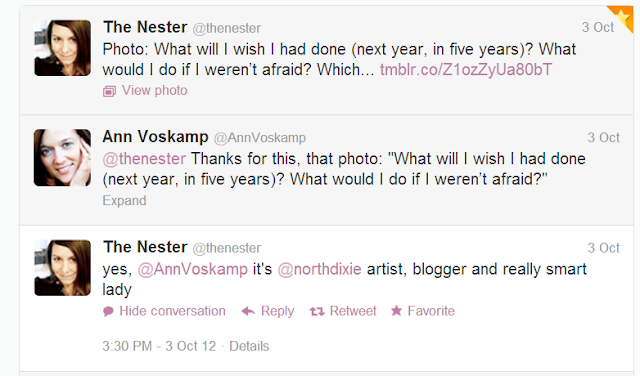 ;-) Thank you, Nester, for using your words in an encouraging way. This made me think about the value of encouragement. How words have such power to help or to hurt. When it comes down to it, every good movement that happens in this world begins with words. The words translate to people "putting their money where their mouth is." And change is born. But it all begins with words. That's something I want to remember. Last week I responded to a FB post with an opposing viewpoint and ended up hurting someone. The push to share my viewoint wasn't really worth hurting someone. In that instance, I could have just kept my views to myself. My sharing didn't make one whit of positive difference. That's something I want to remember as well. Today, instead of getting up at dawn to compete with a mob of people for a Big Screen TV, I want to take this day to think about words, and who has encouraged me, and who I can encourage. Using words, the most precious resource of all.